By far France's largest fine-wine region, Bordeaux is also arguably its greatest, and perhaps the greatest in the world. Grands Vins is the most comprehensive survey of these wines ever published. Following an introduction detailing the history, the geography, the grape varieties, and other regional wine-making idiosyncrasies, Clive Coates—who is reputed to know more about the estates and their wines than the owners themselves—profiles the leading châteaux and assesses their top red and white wines. He discusses the respective qualities, taste characteristics and merits of just about every fine Bordeaux wine made in the last thirty years and more, listing its state of maturity and optimum drinking periods in succinct and accessible form. Since the publication of Clive Coates's Claret in 1982, the Bordeaux region has seen many changes. There has been a run of bumper, successful red-wine harvests unparalleled in recent times. Perfectionist control of the viticultural process is now commonplace not just at the top of the hierarchy but right down to cru bourgeois level, and the vineyards planted following the great February 1956 frost have reached full maturity, producing a quality and consistency that Bordeaux has until now never enjoyed. Moreover, a revival in the fortunes of Sauternes and a revolution in the techniques of dry-white wine making means that the quality of these wines matches that of the reds. For the historian, too, there is far more documentation available about the illustrious pasts of many Bordeaux châteaux than a decade ago; many estates have initiated long-overdue research into their archives, and scarce nineteenth-century books have been reprinted in facsimile. 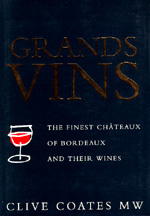 Essential reading for anyone who has cellared or intends to buy Bordeaux wines, Grands Vins is a lucid voyage through the histories of the leading estates, a convivial encounter with their personalities, a fascinating lesson in contemporary wine-making techniques, and above all a celebration of preeminent wines. Clive Coates M.W. (Master of Wine) is one of the world's leading wine authorities. In 1985, after twenty-five years as a professional wine merchant, he set up his own independent fine-wine magazine, The Vine. It is now circulated throughout the world and in 1992 received a Special Commendation for its considerable contribution to the knowledge and understanding of wine from the Wine Guild of Great Britain. He also writes for nearly all the world's other serious wine magazines and is known as an accomplished lecturer throughout Europe and the United States. He is the author of Claret (1982) and Wines of France (1990).